Petrified wood: Petrified logs at the Petrified Forest National Park near Holbrook, Arizona. Image by the National Park Service. 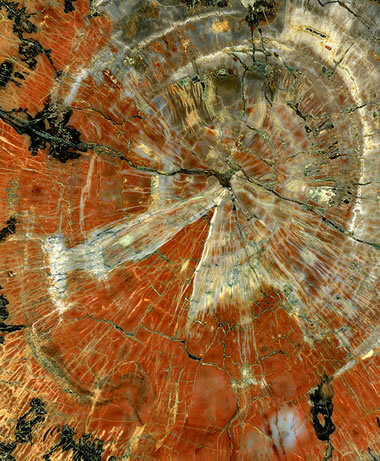 Polished slice of petrified wood: Photograph of a polished cross-section of a petrified log from Arizona. Enlarge the image to see the structure of the wood and even insect borings. Image by Michael Gäbler, used here under a Creative Commons license. Petrified wood is a fossil. It forms when plant material is buried by sediment and protected from decay due to oxygen and organisms. Then, groundwater rich in dissolved solids flows through the sediment, replacing the original plant material with silica, calcite, pyrite, or another inorganic material such as opal. The result is a fossil of the original woody material that often exhibits preserved details of the bark, wood, and cellular structures. Some specimens of petrified wood are such accurate preservations that people do not realize they are fossils until they pick them up and are shocked by their weight. These specimens with near-perfect preservation are unusual; however, specimens that exhibit clearly recognizable bark and woody structures are very common. 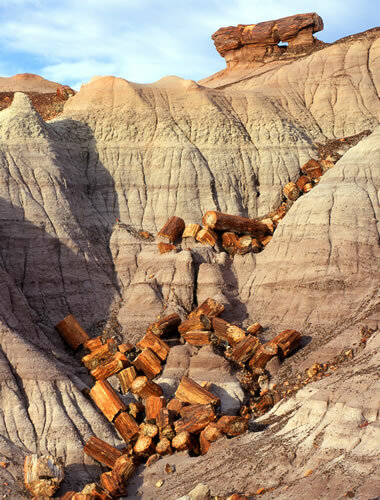 Petrified logs: An accumulation of petrified logs in a gulley at Petrified Forest National Park. At the top of the gulley, a "pedestal log" is suspended on a column of Chinle Formation. When the Chinle weathers away, the log will be lowered to the ground surface. Image by Petrified Forest National Park. Petrified wood: A nice piece of petrified wood representing a limb cross section. This specimen shows the growth rings, cellular structure, and external bark. Specimen is about six inches across. 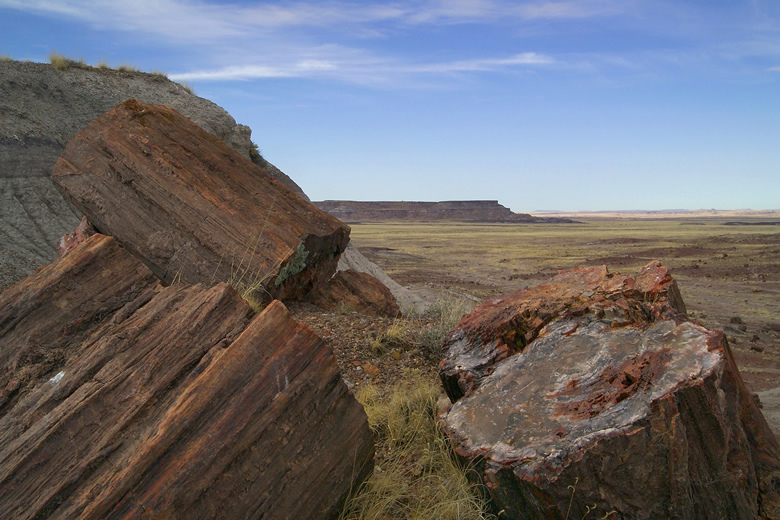 The most famous locality for observing petrified wood is Petrified Forest National Park near the community of Holbrook in northeastern Arizona. About 225 million years ago, this area was a lowland with a tropical climate and covered by a dense forest. Rivers flooded by tropical rain storms washed mud and other sediments into the lowlands. Enormous coniferous trees up to 9 feet in diameter and 200 feet tall lived and died in these lowlands. Fallen trees and broken branches were often buried by the river sediments. Nearby volcanoes erupted numerous times. These eruptions blanketed the area in volcanic ash with a high silica content. Rapid burial allowed the plant debris to escape destruction by oxygen and insects. The soluble ash was dissolved by groundwater flowing through the sediments. The dissolved ash served as a source of silica that replaced the plant debris, creating petrified wood. Trace amounts of iron, manganese and other minerals were included in the silica and gave the petrified wood a variety of colors. These sediments, plant debris, and volcanic ash became part of a rock unit known today as the Chinle Formation. In the millions of years after the Chinle Formation was deposited, the area was uplifted and the rocks deposited above the Chinle were eroded away. The petrified wood is much harder and resistant to weathering than the mud rocks and ash deposits of the Chinle. Instead of eroding away, the wood accumulated on the ground surface as the surrounding mud rocks and ash layers were eroded away. That is why areas of the Park are covered with a litter of petrified wood trunks, branches and fragments. Today, visitors to the park can observe the petrified wood and photograph it; however, collecting petrified wood in the park is prohibited. Peanut wood: A close-up of a slice of petrified wood from Australia known as "peanut wood" because of its white markings the size and shape of peanuts. The "peanuts" are actually boreholes made in the wood by a shipworm which is a tiny species of clam. If you look closely you can see a spiral-shaped boring that traverses the width of this image (second row from the bottom). Learn more about peanut wood. Petrified wood is not rare. It is found in volcanic deposits and sedimentary rocks at many of locations worldwide. It is sometimes found where volcanic activity covered plant material with ash, mudflows or pyroclastic debris. It is found where wood in sedimentary deposits was replaced by minerals precipitated from groundwater. It is especially abundant around coal seams, although many of the wood specimens in these locations are casts and molds rather than petrifications. One almost unbelievable material from Western Australia is known as "peanut wood" because of its ovoid markings, but those markings are actually boreholes drilled by a clam! Colorful petrified wood: Petrified wood with spectacular colors and full petrification is highly prized for lapidary work. It can be polished and used to make jewelry and many other crafts. Image by Petrified Forest National Park. Opalized Wood: A very nice piece of opalized wood from Oregon. It is colorful, accepts a bright polish, and shows excellent wood grain. This specimen measures about 3 inches across. Some of the best specimens of petrified wood have been preserved by silicification. Two forms of silicification are common. The most abundant is wood that has been replaced and infilled by chalcedony (sometimes called "agatized wood"). The other form is wood that has been infilled and replaced by opal (usually called "opalized wood"). Both of these varieties can be called "silicified wood" if you are not certain of their identity. These materials can have a similar appearance that requires testing to positively identify. However, if you have experience in geology or gemology, the tests below are very helpful in separating them. Opalized wood has a lower hardness, a lower refractive index, and a lower specific gravity than agatized wood, as shown in the table below. 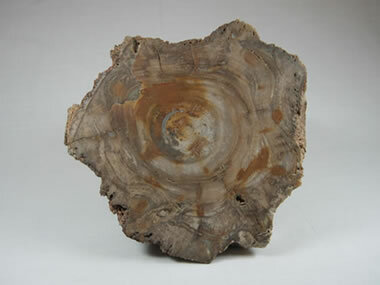 Lapidary-grade petrified wood: A nice piece of petrified wood suitable for lapidary work. The pore spaces in the wood have been completely silicified, and the piece is relatively free of fractures. It also has nice color. Petrified wood like this is very hard to find. Specimen is about three inches across. 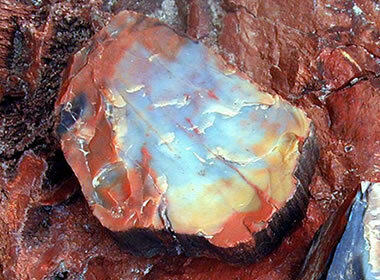 Petrified wood is often used in lapidary work. It is cut into shapes for making jewelry, sawn into blocks to make bookends, sawn into thick slabs to make table tops, and sawn into thin slabs for clock faces. 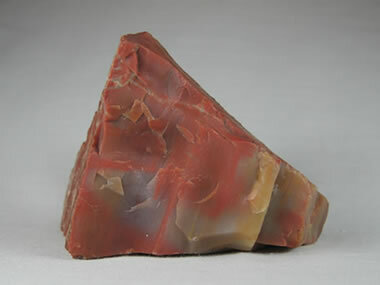 It can be cut into cabochons or used to make tumbled stones and many other crafts. 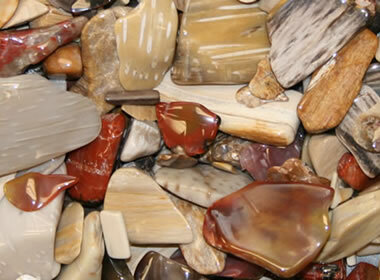 Small pieces of petrified wood can be placed in a rock tumbler to make tumbled stones. Only a small fraction of petrified wood is suitable for lapidary work. Poorly preserved specimens, those with lots of voids or closely-spaced fractures do not polish well or break while being worked. Specimens with no fractures or voids and with spectacular color are highly prized for lapidary work. Collecting petrified wood can only be done on private property where permission has been obtained from the landowner, or on limited tracts of government lands where small quantities are allowed to be collected for personal use. Before you collect, get permission and collecting rules from the owner of private property or from the agency in charge of any government land where collecting will occur. 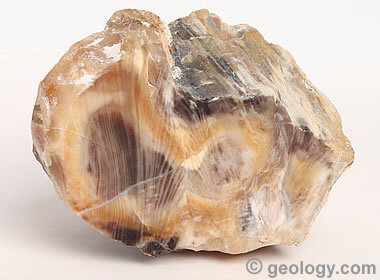 Tumbled petrified wood: One of the most popular lapidary activities that uses petrified wood is rock tumbling. Small pieces of petrified wood that are free of pores and fractures are placed in a rock tumbler and tumbled with successively finer abrasives and finally with a rock polish. The results are polished pieces of petrified wood in baroque shapes showing the color and grain of the wood. The pieces of petrified wood in the photo above range in size from about 1/4 inch to 1 inch. Crystals inside petrified logs: Some petrified logs contain a spectacular surprise! 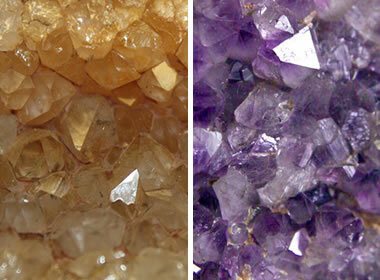 Cavities within them served as crystallization locations for quartz crystals such as the citrine (yellow, left) and amethyst (purple, right) shown here. Images by Petrified Forest National Park. Louisiana palm wood: An oval cabochon cut from Louisiana Palm "Wood." The top of the cabochon was cut parallel to the trunk of the palm. The lines represent the vascular structure of the plant. The cabochon is about 57 x 33 millimeters in size. A material found in the Catahoula Formation of Louisiana, Mississippi and Texas is widely known as "petrified palm wood." However, palm plants really don't produce "wood." Instead their trunk is made up of parenchyma, a fibrous support material that is surrounded by hollow tubes of the vascular structure known as xylem and phloem. These tubes transported water, nutrients, wastes and other materials through the plant.